At Commis, James Syhabout presides over deceptively complex dishes juxtaposing subtle shades of flavor. At Hawker Fare, he cooks the kind of food he likes to unwind with after clocking twelve hours in the fine-dining mill. 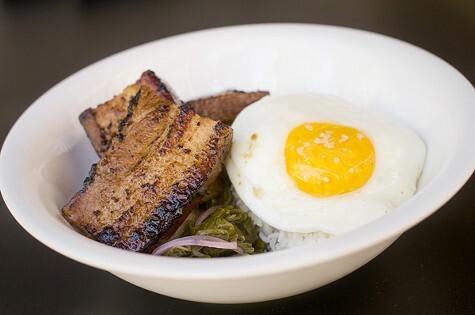 Syhabout — who grew up in Oakland, and whose family has roots in Northeast Thailand — has compiled a short list of Asian rice bowls with the kind of uncompromising flavors he recalls from his mom’s kitchen, recreated with the tools of a Michelin-starred kitchen (hint: the immersion circulator never stops whirring), like long-cooked pork belly and a Northern Thai version of Hainanese chicken rice. Hours: Lunch Mon.-Fri. 11 a.m.-3 p.m.; Dinner Thu.-Sat. 5-9:30 p.m. Crisp fried vegetarian rolls of taro root, onions, carrots, bean thread and wood ear mushrooms served with sweet and spicy sauce. Rich chicken broth with ground chicken, tofu, bean thread, spinach, napa cabbage, cilantro and toasted garlic. Fresh broad rice noodles pan scrambled with eggs and broccoli in a sweet dark soy sauce. Grilled chicken marinated in lemongrass, garlic and crack coriander served with sweet chili sauce. Local pride and mutual respect are fueling an increasing number of joint efforts between East Bay chefs, brewers, and distillers. Plus Hawker Fare debuts bar-friendly menu additions.